He doesn’t. He is ideologically opposed to the idea of REITs (for some unknown reason) and will make stuff up to further his case. There is no evidence that the State is behind this. Also, I don’t understand this talk of tendering processes. If people want to set up a REIT, then raise the money if you can and list it on the stock exchange. There’s no mystery to it, no law to prevent whoever wants to set up a REIT from doing so as long as the basic rules are met. 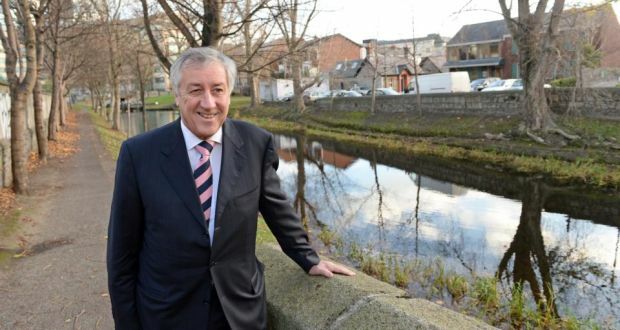 I am not connected to any REIT, my interests relate to wealthy non-EU immigrants coming to Ireland, but it seems to me that everything that has happened to date regarding REITs in Ireland has been reasonably positive. Forget about keyboard speculators trying to sound clever, the actual evidence to date is that (a) Green’s share price increased by 20% since July and (b) Hibernia have attracted the level of investment that they sought. I am all for the Green REIT but not as an investor given its - constant - very high premium to NAV (vs. even IPUT or buying direct). I am not for your REIT (the Hibernia REIT) set up by insiders with no Irish property investing experience and chequered track records. I hope your non-EU immigrant clients can use the internet and due some diligence on your ‘tax break du jour’. Perhaps some ‘keyboard diligence’ will save them money and hassle in the longer-term. I have a passing knowledge of this where €350m was raised from institutions prior to listing. Are you suggesting the Government/NAMA/semi state were pre investing in the fund? you forgot to add a few more names to that list including NPRF, NewEra (plus various sub sections), separate pools in other ‘state-backed’ funds. (hence the ‘lucky’ in LuckyMe1). I repeat the question, how do you know the State is the largest investor in this REIT? Or is it just ideal speculation? You could be on to something there. Several centuries ago European pension and widows & orphans funds got wiped out investing in rolling out US railroads. In hindsight, the idea was right (the US had a big future ahead) but the investment was a heart breaker. It led to a lot of hardship in the north of England and Scotland. It was a watershed moment for Wall Street however as the US got it railroads and the lightbulb went off in Washington. Wall Street have been doing it ever since. I heard from a broker at a bulge bracket, that Hibernia had demands for north of 700M, but certain investors complained of dilution. There was apparently a concern as to whether or not they could place that kind of money. If you believe that then I have a bridge to sell you. I heard the complete opposite - that they had really struggled to hit their target, just as well the stock market was on a tear of late! The Sunday Business Post are reporting a figure of €750m worth of interest. Ian Kehoe of the SBP on Ballsy O’Connor last night spoke of a queue of investors lining up to buy property in Dublin. Someone should alert them to the sages on this site. I think you are conflating the views of the users here in relation to this REIT and property generally. Hibernia said it raised €365 million from investors on its admission to the Dublin and London stock exchanges last Friday, reportedly having had €725 million of demand, with around Euro 80 million invested by retail investors. “interest” is a very loose term. Do you know what bids were submitted? As we have posted (exhaustively), Hibernia REIT team as almost no experience in actually buying Irish real estate. We have also posted (exhaustively), several Hibernia REIT board members were involved in Irish Nationwide. Irrespective of Anglo / AIB / BOI etc. madness, Irish Nationwide’s corruption and fraud are on another level. Terrence O’Rourke, managing partner of KPMG, Hibernia Board member who audited IN has never faced sanction. Danny Kitchen, Chairman of IN, got Michael '“Fingers” Fingleton out without facing prosecution and with full pension / bonus. Poor old Michael “Fingers” Fingleton was let down by poor systems / processes. And as per Bertie’s tribunals, the cost of investigating the fraud always seems to be greater than the fraud discovered. “You realised quickly there was a lack of structure in the place, proper management structures [in Irish Nationwide],” he says. What about the Ernst & Young investigative reports which raised serious concerns about corporate governance in the society? “They found something like €72,000 of questionable expenses . . . some of those were defensible, and some of them weren’t,” says Kitchen. A case of buyer beware I guess. It seems you can fool some of the people all of the time. No doubt competitiveness of bidding for prime office around Dublin will get more intense. A lot of what he says in that simply is not credible. What a shithead. Green REIT just passed the 1.30 mark. By my calcs they spent about 5-10 cents on flotation fees etc. The 1.30 price is therefore about 40% above the true NAV. They bought one portfolio but outbid a large field for it and paid a very full price for it. Not only that but the general markets have been weakening lately. Interesting. Its clearly overvalued but are you implying that the government is somehow pumping the price? How exactly? And this is the first I have heard of Green forming part of the government’s valuation basis. Is there something published by Government/NAMA? When you see what they have being doing - with Draghi’s help - to manipulate the bond market, 50k to manipulate the real estate market is value for money. NAMA have no formal basis of valuation bar the disclosed 4.5% (which no building has yet been sold at), however anybody familiar with the ‘art form’ of agent valuations will know that the Green REIT ‘surreal’ premium to NAV will be fully employed to at least add 10-20%?! I was told how in 2009 during the first major NAMA valuations, a tiny transaction of a site in D4 was used to benchmark huge amounts of land in SCD. This is how ‘subjective’ property valuations are - the Green REIT premium will be mana for this. Sure the motive is there but can’t see how they would do it. Besides there are enough eejit investors out there to do it for them. No doubt you are right about the agent valuations. I’m sure some nice graphs are being prepared for the end of year glossy brouchures. (a) They can do it direct using the liquidity they control directly (NPRF, NTMA, newEra etc). Although that is probably too crude a route. (b) They can do it via the capital they control indirectly (AIB, BlueBay etc). Although again, not a good trail to have (although this is how they manage their bond yields). © The preferred method is probably via a confidential ‘friendly’ third party they can repay in other ways. This would be institutions / entities that are ‘natural buyers’ of stocks but who owe the Government money. This would include every stockbroker in Ireland and a lot more you could imagine. Again, given the net traded daily shares of Green REIT (i.e. bought less sold) is so tiny the cost of supporting the share is small. When compared against the benefit of 100bn of Government real estate valuations, it is a no brainer? Green REIT is now almost 50% above NAV ?!?!? Whoever is ‘ramping’ this stock to the year end needs to take a break - starting to get ridiculous? I have nothing against reits or property investment when it adds up but the green and hibernia reits are a bit strange. Doubt government is pumping though. This is usually done by financial institutions who are in a particular type of wealth management, transferring other people’s wealth to themselves. Strategy seems very similar to many aim quoted companies I.e. float some company with a sketchy business plan and lure investors in. If it pans out in a similar way liquidity could well dry up for these shares. Anyone know what brokers might be market making in the green REIT?